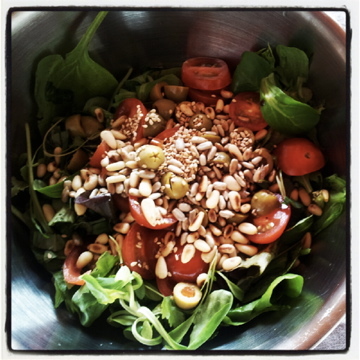 This crunchy salad positively oozes anti-oxidants – check out the links for what you get from the pine nuts and sesame and sunflower seeds it contains. It’s not the lowest-calorie salad you’ll ever eat but we’re pretty sure it will quickly become one of your favourites. The toasted seeds give it a crunchiness that many salads lack, making it great to serve with soft-textured dishes like pasta. Place the salad leaves, cherry tomatoes and olives in a salad bowl. To toast the seeds, heat a medium-sized saucepan over a medium heat. They cook at slightly different rates so toast them separately. First add the sesame seeds, which toast quickest. Keep moving the pan, remove when they start to brown and tip onto the salad. Next do the same with the sunflower seeds. Finally toast the pine nuts in the same way. Pour on the oil and vinegar and toss the salad gently. (This doesn't need a complex dressing - light oil & good vinegar will do just fine). Serve with crusty bread and cheese for lunch, or with pasta for a more substantial evening meal.